Bollywood superstars Shah Rukh Khan and Salman Khan took their association further, the first song of Shah Rukh Khan's upcoming next 'Jab Harry met Sejal' is attached to Salman Khan's recently released film 'Tubelight'. While it is usual for film trailers to be attached to a releasing film, but this time SRK is coming up with something unique as his upcoming flick 'Jab Harry met Sejal's' first song 'Radha' is attached to 'Tubelight'. Not just that, 'Radha' will be the only content to be attached with Tubelight's censor certified print. 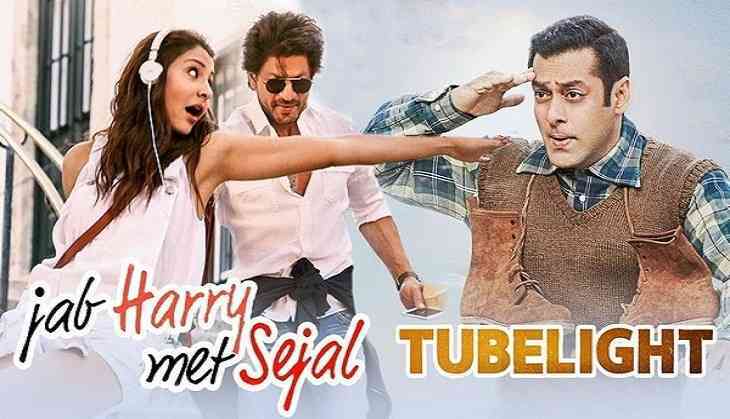 While the team of 'Jab Harry met Sejal' have hit a masterstroke by releasing a series of 'mini trails' leaving the audience hooked to their content, attaching the peppy song 'Radha' song with Tubelight will further prove to be a crowd puller for the film. The ' mini trails' and recently released ' Radha' has been receiving tremendous response from the audience across quarters leaving them etched with the characters of Harry and Sejal and relating to their quirks, dreams and complexities. Presented by Red Chillies Entertainment, 'Jab Harry Met Sejal' is directed by Imtiaz Ali. The film stars Shah Rukh Khan as a Punjabi Harinder Singh Nehra and Anushka Sharma as a Gujarati girl named Sejal Jhaveri, ' Jab Harry met Sejal' is all set to release on August 4th 2017.